There was no forward planning whatsoever, but by pure fluke we ended up in the UK for the centenary celebrations of the end of the Great War. Although the last living veteran of World War I died in 2012, aged 110, this rather special Remembrance Day has obviously hit a chord here in England. On Saturday night, on BBC One, we watched the Royal British Legion host the Festival of Remembrance at the Royal Albert Hall, attended by most of the senior members of the Royal Family. This is an annual event that has been held at the Albert Hall since 1923 to commemorate the British and Commonwealth servicemen and women who lost their lives in the two World Wars and today, subsequent conflicts as well. Full of pomp and circumstance, marching and music, there were many spine tingling moments, not least when the ceiling rained with red poppies upon the heads of the silent servicemen and women during the two minutes silence. And despite the recent Royal fervour, following two royal weddings and royal babies, it was a sign of the solemnity and importance of the occasion that for once the cameras were not fixed on the Duchesses of Cambridge and Sussex, but on those soldiers performing in the centre of the hall. We also joined in to two minutes silence on Sunday morning, when we walked down to the village green, to observe the Remembrance Day service in front of the village church. The local scout troops, church officials and the choir paraded around the village pond, before gathering around the cenotaph. 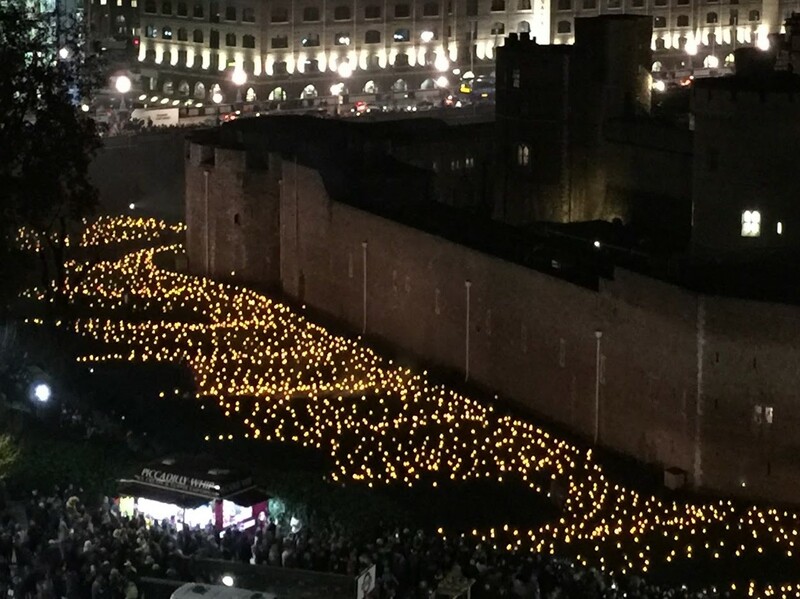 It is a moving, albeit a slightly unnerving experience, to stand in complete silence for two minutes among a large crowd of strangers of all ages, from the elderly in wheelchairs to the small children in their prams, and everyone in between. The rain fell lightly throughout the service, but as it came to an end, the rained stopped and the sun came out as if specially choreographed. Later, we caught the train to London, to stay near the Tower of London. 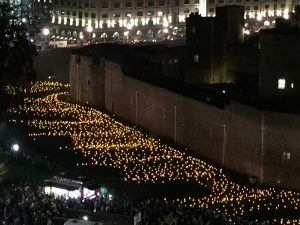 From the seventh floor of the CitizenM hotel at Tower Hill, we were able to watch the fabulous light and sound installation, “Beyond the Deepening Shadow: The Tower Remembers,” created as an act of remembrance for those that died in the Great War. From country churches to city cathedrals, poppies have been thick on the ground. You may remember the ceramic poppies that were made to fill the moat at the Tower of London four years ago, to commemorate the 100th anniversary of the beginning of the Great War. 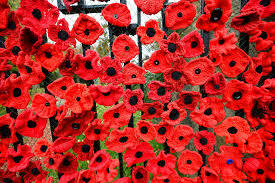 This year, every country church we passed was bedecked in knitted woollen poppies. They may not survive a heavy deluge of winter rain, but for now they are a bright, international symbol of remembrance in an otherwise grey world. * With thanks to Google Images for the amazing knitted poppies, and the One & Only for the glorious view of the Tower on Armistice Day. We have been blessed with an Indian summer in Europe this year that did not pack its bags and head south until the middle of October. Since then, Autumn has kicked in with a vengeance (making up for lost time?) and the early morning mists and chilly damp have returned. On Tuesday, we even had the first snow for the season, although it only settled briefly on roofs and heads, melting as soon as it hit the ground. This morning, in need of fresh air and a good walk, I head north to Echternach to stroll around the town’s thirty-hectare, man-made lake. Here, the clouds are sitting low on the brow of the hill, entangled in the treetops, bleaching the colour from the leaves. Still, the park looks beautiful in its autumn colours, and the lakeside is humming with activity. Walkers, dogs and fishermen are unusually prolific. Stripy, hand-sized fish hang suspended in the dark green water of the lake, while a brace of ducks socialize noisily on the shore. One solitary and elderly crane sits on a rock, huddled, arthritic and miserable, in dire need of winter woollies. After a lap of the lake, I drop into the new Lakeside restaurant, where the lovely waitress remember me from a previous visit and makes me the best coffee I have found in all of Luxembourg, so hot that it melts the plastic straw that I have been given to stir it with. Lakeside only opened this summer. Light and airy, it is perfectly located at the top end of the lake, with the fountain taking centre stage. On a warmer, sunnier day, there is a broad terrace on the foreshore. Today, I find a table near the bar. Lakeside has a touch of Scandinavia: lots of space, blond wood and simple, unfussy décor. Apart from the back wall, it’s all windows, from the polished concrete floors to the high ceilings that are strung with large onion shaped, wooden lampshades. I love this town, and this peaceful spot in particular. It’s a wonderful place to write and Echternach is so much more relaxed than Luxembourg City, the people welcoming and friendly. The second language here seems to be German more often than the French of the city, and the attitude is much more easy-going than the highly-strung atmosphere of the capital. The staff smile, chat and do what they can to make customers happy. It’s a far cry from the clipped, impatient, somewhat cool customer-service one receives in the south. How can a twenty-five-minute drive make such a difference? Yet, it does. I sip slowly through two coffees, before the morning drifts into lunchtime. There is a very reasonably priced menu du jour or a more varied a la carte menu. Either way, many of the dishes have a Germanic influence, which is hardly surprising given that we are literally a stone’s throw from the German border. After a little help with translations, I opt for the menu du jour. A hefty slice of homemade terrine de volaille aux champignons (chicken terrine with mushrooms) followed by a wholesome noix de jus de porc braisee, knödel de pomme de terre et choucroute (braised pork, with sauerkraut and potato dumplings). 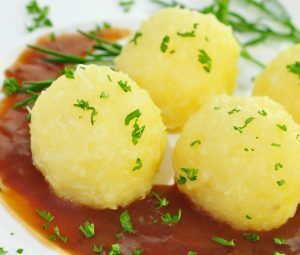 I could have chosen carbonara or träipen (Luxembourgish black pudding) served with red cabbage and apple sauce, but I love the sound of pork and dumplings: plenty of meat and carbohydrates to brighten up this rather dull and heavy autumn afternoon. Feeling rather heavy myself, after such a filling lunch, I stroll outside to chat with the friendly Egyptian geese by the lake, and dodge a couple of rather officious white geese (straight out of Beatrix Potter minus the bonnets), who make a dive for my ankles. Safely back at the car as a light drizzle sets in, I meander home through softly rolling green hills and golden woods. *Photos care of the Lakeside Facebook page and Google Images, with thanks for better photography than mine! My One & Only and I have always loved wandering through the woods on a fine day, and this weekend was no exception. With guests in town and the rain holding off, we headed for the wild woods of Luxembourg,. 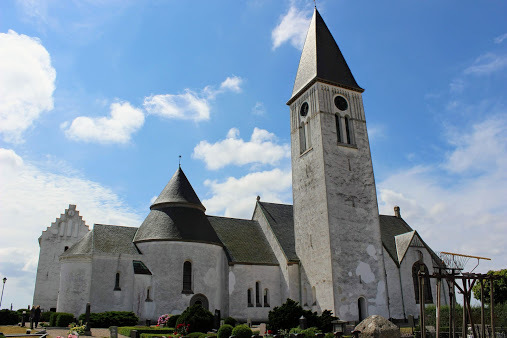 Always a popular place for walkers and cyclists, Mullerthal – or Mellerdall in Luxembourish – is located in eastern Luxembourg, south west of the Ardennes. It is known affectionately to the locals as Little Switzerland. Despite the somewhat romanticized nomenclature, there is no doubt that Mullerthal is a gorgeous area. 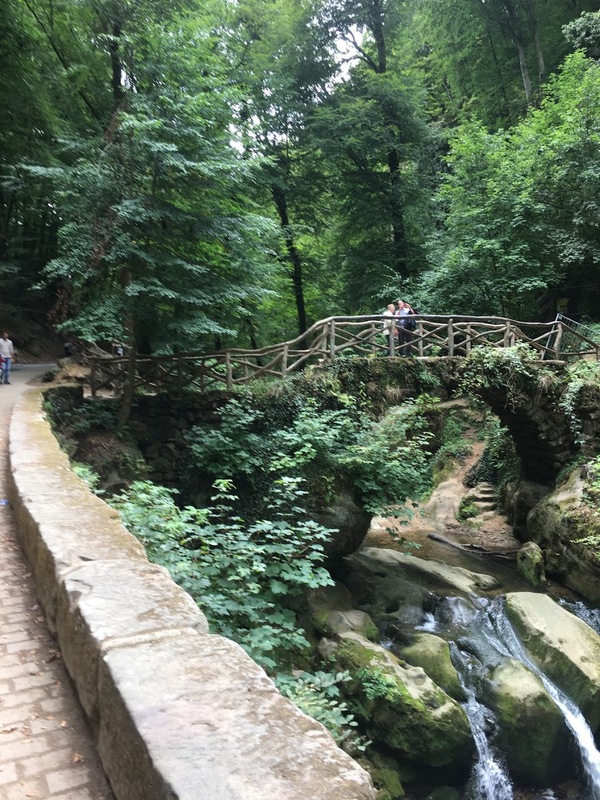 With myriad walking paths, thickly wooded hillsides, clear, sparkling streams and boisterous waterfalls, pretty bridges in wood and stone, caves and craggy rock formations, Mullerthal is enchanting at any time of the year. Walking up through the quiet, green beech woods along the river, the only sound we could hear was the gurgling and plashing of waterfalls below us, and the odd bird call. Our path eventually dipped back down to the valley floor, and into the tiny hamlet of Mullerthal, which houses both a vast population of 146 and one of my favourite restaurants in Luxembourg. Heringer Millen sits in the centre of the valley, an old water mill converted into a bright, modern restaurant with an outdoor terrace for sunny days. 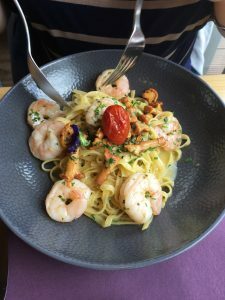 Usually, it is necessary to book weeks in advance, but in August, with the entire Luxembourg population denuded to about 146 (everyone has run away for the summer), we have been able to book a last-minute table most weekends. Service here can get a little curt and distracted as soon as there are more than a handful of diners, and it seems I’m not the only one to have noticed this. Yet, despite the frantic flurry of staff, we were soon sipping cold beer on the terrace, and only moved inside when this summer’s plague of wasps scuppered our plans to eat outdoors. However, a table by the window meant we could still watch the beautiful day through walls of glass. Heringer Millen has a seasonal menu, and this one is melting gently into autumn, with the appearance of rhubarb, apples and chanterelle mushrooms. Beautifully presented and carefully prepared, there is something to suit everyone’s tastes, be it a glass of crémant with designer lamb burgers, a Pinot Gris served with a tagliatelle topped with prawns and chanterelles, or a cold beer and flammkuchen. There is a casual menu for muddy-booted hikers, if they can find a table on the terrace. And the surrounding meadows provide plenty of space for the kids to play when they get restless. Worth noting: the homemade bread is especially good, and generously served with a light, creamy fish paste. And luckily for our waist lines, there was a short hike back to the car when we were done. Later in the day, surprisingly hungry despite that hearty lunch, we walked down into Clausen, dodging the crowds heading to the Schueberfouer, the annual fair at the top of the town. Founded in 1340 by John the Blind, Count of Luxembourg and King of Bohemia, the Schueberfouer visits Luxembourg for three weeks towards the end of August. The carnies park their huge mobile homes in a road at the top of our hill, which is always a good reminder to avoid Glacis Plaza at all costs. Of course it’s great fun for the kids, but surprise, surprise, I am not a crowd person, and no longer enjoy the wild rides that used to be such a thrill in my teens. So, instead of joining the throngs heading up to the fair, we headed for a calmer corner of town. Beside the Alzette river backing onto the old Mousel brewery, is La Biblioteca, a Mexican restaurant offering tacos, burritos, quesadillas and tequilas – not to mention margaritas and mohitos! The weather had cooled noticeably after weeks and weeks of an unusually hot summer and unadulterated blue skies, but the evening was still. Again, the prominent sound was the rushing water, but here the wine was Argentinian, not German. Reviews have been mixed – some will never go again and complain of bland food and bad service. Others loved it. We were in the latter category. The food may not be cordon bleu, but it is extremely tasty. The setting is relaxing, with a lovely view over the river, and it has a cosy atmosphere. The staff wasn’t wildly enthusiastic to see us – perhaps this is simply a Luxembourg trait? – but perfectly polite, and the food hit the spot. I am no expert on Mexican food – to me it always suggests fast food drowned in American cheese – but I found this menu surprisingly appetizing and nicely presented. And it was undoubtedly the perfect accompaniment to mohitos and beer. We strolled home full of guacamole and good cheer. ‘the sun and her flowers’ is a wonderful little book about loss and grief by Indian/Canadian poet Rupi Kaur. And yes, I have transcribed it correctly. Rupi Kaur uses neither punctuation nor capitalization, but occasionally throws in a phrase in itallics, for emphasis. I won’t attempt to mimic it in prose, it would just confuse both of us, but the sentiment is all too familiar. As serial expatriates, our friendships – when we know our time together may be short – become very strong, very fast. And we are used to the notion that we must frequently say goodbye to friends packing up to leave, or as we move on ourselves. And for that reason, much to the chagrin of my One & Only, I love social media. It keeps me in touch with friends and family all over the world. It has even reunited me with a couple of mates I thought I would never see again. Friends, like us, who have moved so many times that we lost touch somewhere down the track, and I had come to believe only a miracle would allow us to cross paths again. 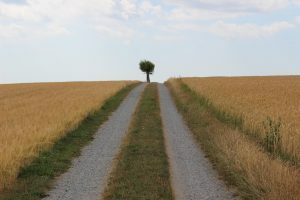 My One & Only may groan, but the life of a trailing spouse would be far lonelier without the likes of email and Facebook, What’s Ap and Twitter. From time to time, I read whimsical little quotes that remind me how lucky I am to have such friends: where neither time nor distance matter, because we always pick up where we left off, however long the time between meetings, and I am grateful for them. Setting up home in yet another new country, without the kids to provide an entrée to the PTA or rugby clubs, social media has proved invaluable. It has also given me the chance to reunite unexpectedly with friends on the road. ‘You’re in Norway? So are we. Dinner on Friday?’ or ‘What are you doing in Bali? We’ll be there next week. Lunch at the beach?’ or ‘Hey, I’m in London too! Got time for coffee at Borough Market?’ OK, don’t mock, these are first world privileges I know, but such mobile communities are a pure blessing when you don’t have a constant base. A year or so after leaving the Philippines, I found myself, somewhat to my surprise, feeling deeply homesick for Manila. I was really keen to return, to good friends, favourite places, favourite food. Thus, after a family reunion in South Australia, I took a detour from Hong Kong, to spend ten days back in Luzon. The anticipation was enormous, and let’s face it, that can be the best recipe for disaster. Yet, it was all I could have hoped for. The weather was mild. The sky was blue. Our driver of five years put himself at my disposal, which alleviated all the hassle of finding taxis and kept a good friend at my side for my time in town. For several days I stayed with a girlfriend in Rockwell, admiring the latest developments, revisiting my regular haunts (The Refinery, Rambla) and discovering some new ones (Wildflower, a new Japanese restaurant at One Rockwell), meeting friends for coffee, Aperol Spritz and Matcha ice-cream. The only disappointment was the lack of Christmas decorations. By October, I had thought the usual ‘Ber months’ syndrome would have kicked in and at least the orange fairy lights would already have been strung around the buildings and the palm trees. I did, however, find a small stall with a selection of grumpy Christmas angels I couldn’t resist acquiring for my Christmas tree. Then I decamped to Dasmarinas, to another close friend, for Craggy Range wine by the pool and regular trips to Greenbelt for Colin McKay’s specialties: pork and pink peppercorns at People’s Palace and salt and pepper squid at Blackbird in the much-diminished Ayala Triangle. (I do so wish the Filipinos would appreciate the benefits of city parks as the Brits do. It is my greatest sadness about Manila.) I caught up on all the news of children have also moved away and grown up in the blink of an eye. We shared dreams and aspirations for the future, laughed over past idiocies, reminisced over past adventures. We drank too much wine, ate too much rich food, hugged and giggled and loved each other’s company. At the weekend, I headed out of Manila to the south west coast of Luzon, beyond Nasugbu. Here, far from the madding crowd, is a peaceful little coastal estate where I have stayed with my friends a number of times, and was delighted to return to their warm and generous hospitality, to wander beneath the native trees, smell the frangipani, dip my toes in the sea, take naps, read books, write, build a rockery, and of course catch up on all the news. Then it was back through the achingly beautiful scenery north of Nasugbu, where the mountains meet the sea drenched in jungle, and the earth is chocolate-brown-rich with nutrients. A tunnel, a national park, a sprawling town, and then we were plunging back into the city along a new motorway that has arisen on reclaimed land in Manila Bay, providing a view of all those stark contrasts that remind me so clearly of our life here: a gently lapping sea on the left; fishermen’s huts built from reclaimed corrugated iron and other unwanted rubbish on the right, balancing precariously on stork-like legs, knee-deep in the lagoon; an horizon of soaring high-rises and shimmering casinos and endless knots of concrete overpasses before us. No, Manila traffic has not improved, and the high rises continue to breed with unbelievable speed, particularly in BGC. Everyone I spoke to commented on how bad the traffic has become (when was it ever other than ‘very traffic’ or ‘really traffic’?) Yet the people still smile a welcome, the food is fabulous (did I mention the Jurassic prawns of spectacular proportions? ), and after two return trips to The Refinery for my morning coffee, everyone knew ‘my usual.’ I felt, in the best ways possible, that I had never been away. Ten years ago, I was writing a thesis on rural Food and Wine Festivals. It gave me the excuse to spend a lot of time in several lovely wine regions, like Orange in New South Wales and the Clare and Barossa Valleys in South Australia, in the name of research. Yesterday I revisited Clare with Son Number Two. It’s a bit of a long haul from Adelaide for a day trip – two hours in each direction – but it was all the time we had to spare. Next time, I plan to set aside at least a week to explore the copious number of wineries that have sprouted up since I last visited in 2008. Our prime destination, however, was an old favourite. Tim Adams Wines is a family owned winery on the edge of Clare, 130km north of Adelaide, South Australia. It is perched above the Warenda Road and adjacent to the Riesling Trail, a popular cycling track along a disused railway line between Auburn and Barinia. I had first popped in with my parents, an English guest and two small children, heavily pregnant with the third, in the winter of 1997. 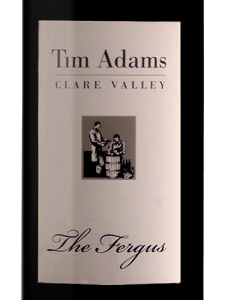 Expecting a boy, we had chosen the name Fergus, and were delighted to discover that Tim Adams had just released a red wine in his honour. We bought a dozen in anticipation of 21st celebrations. Tim Adams Wines was born in 1984, a partnership between winemakers Tim and Pam Adams and local coopers, Bill and Jill Wray. Although the partnership was dissolved within three years, the Adams have gone on to make some great wines. Arriving on the dot of noon, we began – of course – with the latest Fergus, a 2014 Tempranillo Grenache Malbec blend. The Fergus is, like our son of the same name, in its 21st year of production. It was not actually named for Number Two Son, surprisingly enough, but for an Adams neighbour. Fergus Mahon sold Tim some Grenache grapes in 1993, when there was a desperate shortage of Shiraz and Cabernet. A softer style than either of these traditional varieties, The Fergus has Tempranillo’s red berry and cherry flavours that meld beautifully with Grenache’s earthy spiciness. And Malbec, we are told, is the perfect additive for filling out the mid palate. Unfortunately, The Fergus only has a ten-year shelf life, so the dozen bottles we bought the year of its birth have long gone, but on this trip, we have been indulging in a few of the 2014 vintage, as the Spring weather turned unexpectedly cold, and curries and roast lamb have been making a late reappearance. Another one for which our Fergus discovered a liking was the TA tawny port. Initially uncertain, he eventually tried a sip, after I had regaled him with boozy university tales of cheap port served in Vegemite jars. It took only a sip for him to change his tune entirely. Modelled along the same lines as some of Portugal’s best tawny ports, this 20-year-old fine tawny is a lighter colour than many other Australian tawnies, and not as sweet, as, TA do not add caramel to their recipe, as many others do. Its extra maturity also adds a complexity that others fail to deliver. We were swooning with joy, as we imagined nights round a camp fire, guitars, Vegemite jars..
A 2015 Cabernet Malbec also made its way into our box. Cabernet Sauvignon is a good, consistent variety that performs well in the Clare Valley. As with the Fergus, the addition of Malbec adds to the texture and richness of the mid-palate, resulting in a full-bodied wine with expansive, chalky tanins. Twenty-four months in French oak adds complexity, and it is possible to cellar this one for at least ten years. As always, this Cabernet pairs beautifully with lamb and other red meat dishes. 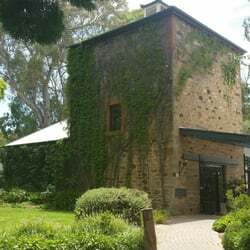 Tips for lunch included Mr. Mick’s Cellar Door & Kitchen, where Tim Adams and his partner Brett Schutz have established a tapas restaurant and a cellar door to exhibit a range of inexpensive, unpretentious wines in the old Stanley Leasingham winery. Here is where Tim began his winemakers apprenticeship with ‘Mick’ Knappstein, so keeping it in the family, we headed into town. Unfortunately, the long drive back excluded me from mixing wine with lunch, but we had tasted enough at Tim Adams to feel relaxed and happy. We chose two dishes each and thoroughly enjoyed our choices. Sharing everything, of course! First, our waitress arrived with fresh, home-made bread, soft and warm from the oven, with terrific crustiness. This was served with local Emu Rock olive oil and Mr Mick’s spicy dukkha. To say we inhaled it, would not be overstating the case, and Fergus claimed another three plates full would not have gone astray. Next, a standard pub favourite that was done to perfection: salt and pepper squid, so tender and light that we barely needed to chew, was served with an interesting orange and chilli dipping sauce. Then, traditional albondigas, or four, fat veal and pork meatballs, which were served with braised fennel and topped with a creamy béchamel sauce. I only managed one, but SN2 was happy to clear the bowl. Finally, the sweetest of sweet potato, roasted, and sprinkled with bacon cubes and crispy shallots, that came so hot from the oven I almost burnt my tongue. A siesta would not have been unwelcome at this stage, but unfortunately it was time to turn south if we were to have time for any further detours. Now, surely, it’s time to light the fire and pour the Tempranillo…? An English castle. A late summer evening. A production of Shakespeare’s The Merchant of Venice. A handful of talented actors. An outdoor stage. A picnic tea. An eager audience. A night to remember. 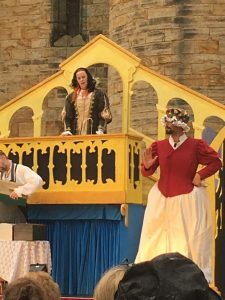 Illyria is a group of touring players, created over twenty-five years ago, that performs open-air theatre for both adults and children. Every summer since 1991, the group has travelled through the UK, Europe and North America, with a wide selection of plays. The actors have changed over the years, but director Oliver Gray has led the troop since the beginning. Years ago, we used to take the kids to watch Illyra productions at Ightham Mote, a medieval moated manor house and National Trust property on the outskirts of Sevenoaks in Kent. I particularly remember a fine performance of Alice in Wonderland. It was a magical spot: the manor house an integral part of the backdrop; a hill for the children to roll down when they needed to let off steam; a picnic tea on the lawn beside the moat. This time, we are at Tonbridge Castle, which looms behind the stage in the twilight. After a remarkably reliable summer of endless blue skies and not a drop of rain, the clouds are gathering over Tonbridge tonight. Fortunately, the rain holds off, as we delve enthusiastically into our picnic baskets and chat with wandering cast members. The troop’s website warns audiences that they will take the mickey out of anyone wandering in late but it appears everyone got the memo, arriving promptly with picnic rugs, tables and chairs. We have also noted the tip to bring wine and cake, but I think most of us left the candelabras at home! We have wisely brought umbrellas and raincoats, too, although the poor cast, on the roofless stage, is not so well protected, as the thunder rumbles overhead and intermittent rain douses them from head to foot. At one point, the thunder and lightening, timed to perfection, takes its cue from the script: ‘Why, look how you storm’ I think, or perhaps ‘it droppeth as from the gentle rain from heaven’? It might have been both. 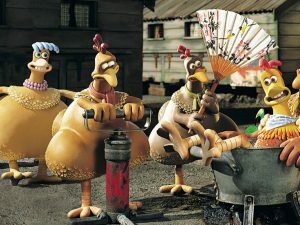 The five actors are appealingly animated and amusing. It is a polished, high octane, performance, with the cast taking on four or five roles apiece, using different costumes and different accents to signify the changes. We are struck by how well they keep track of their various parts, making it remarkably easy to follow the plot. As the website says, The Merchant of Venice is a comedy that deals with serious issues, so it is ‘by turns, gripping, funny, romantic and thought-provoking.’ The audience responds with delight. The performers remain undaunted by the weather, never veering from the script, regardless of the rain, although, by the final scene, we can barely hear them, as the rain pounds down heavily on our umbrellas, and torrents of water pour off the stage. The final lines are delivered in a roar to compete with the storm, an yet, somehow, the cast finishes the play without any appearance of being drenched in the downpour, apart from the occasional need to swipe dripping locks out of their eyes. I particularly loved the fact that the actors obviously enjoyed performing as much as we enjoyed watching them. And it was great to see so many families, with kids of all ages, engaged in the show. Having sat through several slow, dull theatre and film productions of this Shakespearean classic, I wam thrilled that the Illyria team didn’t take themselves too seriously and the humour was paramount. 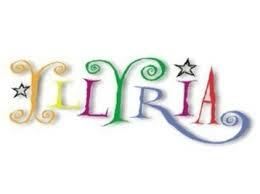 It verged on Gilbert & Sullivan for light-hearted, easy-going entertainment. It was such an outstanding performance, I was tempted to follow them around the country, like a groupie or camp follower, to see their other performances this season: Doctor Dolittle, the Pirates of Penzance and The Hound of the Baskervilles. Sadly, it wasn’t an option, but if you get the chance, I highly recommend tracking them down. You won’t regret it, even in the rain! *Photos care of Illyria and me! The first time I watched a hen’s demise for culinary purposes was in Nepal. We were staying in a remote rural village, being treated like royalty, when our hosts offered us chicken for dinner. At the time, we didn’t recognize the signified of this generous offer. We simply found ourselves in a front row pew for the beheading of an aged chook, who squawked once and then ran headless around the yard for several minutes, gushing blood from her headless corpse. So, not surprisingly, we were hardly inspired to eat the leathery offering that landed on our plates a couple of hours later. Recently, in the UK with friends, there was much discussion about one of the family hens that had taken to eating its own eggs. Not to be encouraged, their first thought was to send it to heaven care of the neighbourhood fox, no one quite having the stomach for a mercy killing. A timely visit from an expert friend saw the chook dispatched with professional alacrity, and we were left wondering what to do with the corpse. I remembered a fellow Gastronomy graduate assuring me that we should all experience killing the food we eat, so as not to take its death for granted. Eventually, consensus was reached. We would not bury it, or feed it to the foxes, but prepare and cook it. Unfortunately, none of us was certain how to achieve this. How did one gut and de-feather a hen? Google – an awesome modern resource – showed us how best this operation could be performed. Placing the dead hen in boiling water would loosen the feathers. A swift attack with a sharp knife would remove its head and feet. Donning rubber gloves would ensure a relatively tidy removal of its innards. Poised at the side of the sink, as the Holder of the iPhone and Supervisor Extraordinaire, I guided the proceedings. Lacking a large enough pot, we doused poor Betsy in boiling water and discovered that the feathers, thus soaked, came off in our hands. It is an efficient method, although it doesn’t smell particularly pleasant. A not-so-sharp knife saw to Betsy’s decapitation (think Nearly Headless Nick) and the removal of a pair of large, crusty feet. No rubber gloves could be found, so a pair of plastic bags stood in as understudy, and Betsy was gutted forthwith. Once every surplus feather, face, limb and liver had been removed, Betsy looked just like a Tescoe’s chook, bar the cling film. Unlike Tescoe’s, who truss chickens neatly, I had to lie Betsy sideways on a plate to fit her in the fridge, to await cremation in the Aga. She looked like she had just curled up for a nap. Needless to say, I didn’t stay for dinner. Well, how could I eat a chicken with a name? But reports were less than admiring: poor Betsy was as tough as the proverbial shoe leather and the fox doubtless feasted on her remains anyway. There is a rather pretty little path between the villages of Otford and Shoreham in north-west Kent that cuts across the golf course and is largely shaded by overhanging trees. On a 30-degree day in August, this is a blessing, as I ramble the long-familiar footpath with old friends. Even the fear of flying golf balls has been removed, as the usual proliferation of golfers has either retreated to the shade or, presumably, to the pub. Shoreham village is an old favourite. The pub is strung with hanging baskets and the tables are brimming with beers and baskets of crisps, consumed energetically by families who have been out walking their dogs up in the hills or along the river. 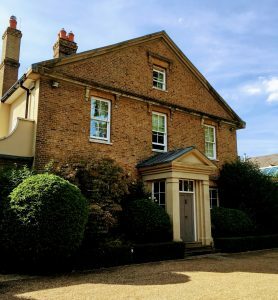 We wander past picturesque cottages draped in roses and wisteria, a church steeple rising above the yews, to discover an unsealed driveway off Church Street. Meandering along the track, we pass an elegant Victorian country house (accommodation available) hemmed in vineyards and sprinkled with sunshine, before reaching the cellar door. 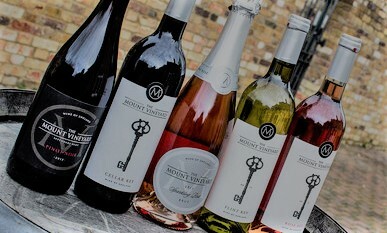 The Mount opened for business in 2008, four years after planting eight grape varieties in the surrounding acres. Maybe it is a sign of the growing passion for wine all around the globe; maybe it is a sign that Trump is wrong and global warming is a reality, but I would never have expected to find vineyards in Kent. Hops, apples, strawberries, yes, but not grapes. And yet the Romans were here planting villas and vineyards that survived for centuries to reappear in the Domesday Book, where vineyards were recorded as far north as Suffolk. So, perhaps I shouldn’t be so surprised to find a thriving vineyard in the Darent Valley, a mere sixty minute stroll from Lullingstone Villa. Probably the most well-known wine at The Mount is the sparkling rosé. Created in the traditional méthode champenoise, from Seyval, Phoenix and Pinot Noir grapes, it is pretty in pink and full of the scent of strawberries. There is also a terrific sparkling brut. Unfortunately, they had run out of supplies when we were there, but the alternative choices were perfectly acceptable. The Flint Key 2013 has a definite aroma and taste of elderflower, with a whisper of honeysuckle and peach, and a splash of citrus. Made from Bacchus and Siegerrebe grapes to create a fun, flavourful white wine, it was a chilled and chatty accompaniment to a light lunch on this hot and sticky summer afternoon. To the winery’s delight, it has already managed to win a couple of awards. Since I first visited in spring last year, The Mount’s dining experience has become considerably more sophisticated. As always, passing walkers are welcome to sit on the lawn or at the picnic tables for a quick glass of wine and a snack. However, if you prefer to drift through the day, indulging in more filling fare and some quirky conversation, then perhaps book a table on the patio with good friends, and enjoy both the company and the extended menu. There is a variety of tasty, stone baked pizzas with thin, crunchy crusts and extravagant toppings, imaginative tasting platters of cheese and charcuterie, and ‘light bites’ that include some heavyweight, home-made pasties served with piccalilli. We threw a selection of everything into the centre of the table and all but licked the platters clean. Obviously, The Mount’s wines are the star attractions on the wine list, but there is also a choice of several extra-curricular wines, beers or spirits, if you prefer. Having eaten and sipped my fill, I strolled back along the Darent Valley towards Otford with my friends, clutching a bottle of the Mount’s best 2015 Pinot Noir to share later with the One & Only, when we both returned to Luxembourg. *With thanks to Google Images for all photos except the last one, as mine weren’t nearly so good! Its been an exceptionally hot, dry summer in Europe this year. Fabulous for us and our tent, but not so fabulous for the farmers. I was born in one of the driest states in the world, where we grew up with summer hose-pipe bans, water shortages and droughts, as a matter of course. We had two-minute showers and recycled the washing-up water to save the lawn from burning to a crisp. Bushfires were a constant threat throughout the summer, but on the other hand, you could rely on good weather for a picnic or a party. I never expected to visit Scandinavia and find a similar scenario. Two weeks camping in Norway, and the nights were cold, but the days were hot. With the temperature gauge stuck at about 30 degrees centigrade, we headed south to Skåne, and a friend’s farm near Ystad. There, we were gobsmacked to see a landscape that reminded us so clearly of a South Australian summer: parched and yellow, dry as dust under wide blue skies. We were warned that a typical Scandinavian summer might be damp and dreary in a tent. Luckily for us, the only rain we saw was a ten-minute shower in Oslo, from our hotel window. I Googled Top 10 things to do in Skåne, and I can only suggest you do the same. We did none of them. We were well off the beaten track, where the scenery was rural, the villages cosy and pretty, and tourists were rare. Here, we were closer to Copenhagen than Stockholm, in a landscape surprisingly flat, after Norway’s dramatic and rugged terrain. 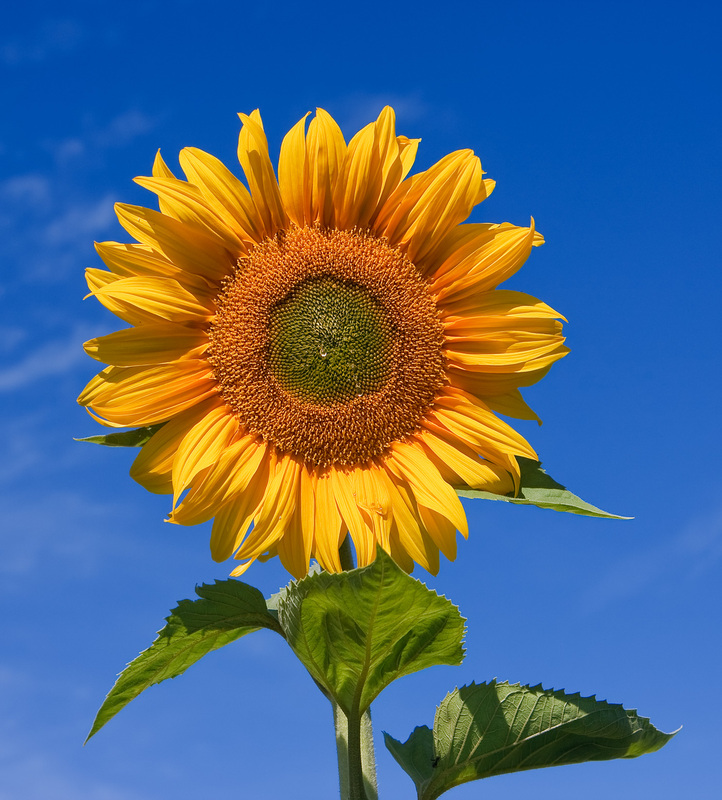 Here wide sheets of blue sky lay before us, stretched tightly over a mattress of yellow corn and wheat. Instead of the tall, lean French poplars, farmhouses were announced by lines of pollarded willows that looked like green lollipops. Closer to the coast, a thick band of forest separated the shore line from the farm land, and once we reached the beach, we found squeaky white sand and dunes decorated in a spiky, spinifex-style grass. It was pure South Australia. The beach is regularly bludgeoned by wind and sea, so, perhaps not surprisingly, we were dodging scattered driftwood and gnarly old tree trunks, roots attached, like petrified octopi. The sand was also thickly coated with bathers, some clad, some not. Yet barely two hundred metres from the car park the beach is empty of any bodies but ours. 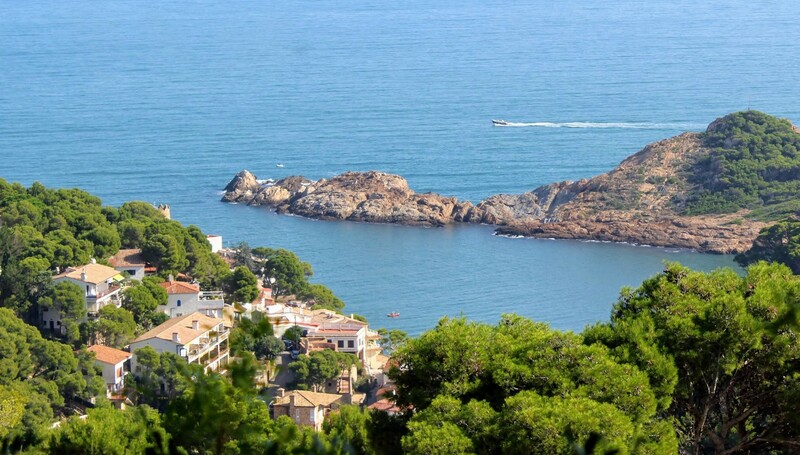 During this mild and gentle summer, the coast was calm and peaceful. Children danced among the waves, or built castles in the sand. But don’t be fooled by its benign appearance: it is a pernicious sea, that hides rip tides, dangerous currents, and shipwrecks galore. In many places, the beach had been torn away to reappear further down the coast, and cliffs had collapsed under the barrage of raging wintry waves, leaving houses perched precariously close to the edge. Ancient standing stones overlooked the sea, a mini Stonehenge, while other signs of pagan times included a summer solstice maypole, or midsommarstången. As a pagan symbol of fertility, its tall central pole with two round hoops at the top certainly send the right message. We explored several small seaside villages, looking almost English with their homely, white-washed or brightly coloured cottages, but the cobbled streets are wider here, the red roofs lower. Then, getting peckish, we indulged in a mixed seafood platter by the port, sampling local specialities such as smoked eel and smoked mussels, gravadlax, pickled herring and smoked mackerel accompanied by cold beer. Back inland, attractive village churches stood out on the skyline, their steeples or stepped roofs rising high above the crops. Mostly whitewashed, they showed off a variety of architectural eras, from the Romans to the nineteenth century. We wandered among gravestones kept beautifully neat and trim, admired the simple decor within. 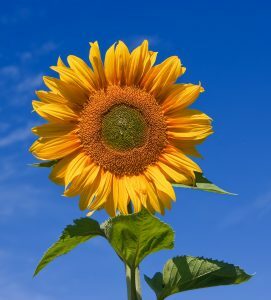 As we drove down empty country lanes, wildflowers ran amok through the wheat and barley, and along the verges: poppies, red and orange; dainty white daisies; splashes of purple and yellow; feathery grasses. As a rainbow put in a brief appearance, I stood in the middle of the road, imbibed with the still calm of the late afternoon. From here, fields of grain stretched as far as the eye could see, the evening light something I cannot begin to describe, but Monet would have adored, in this Provence of the north. 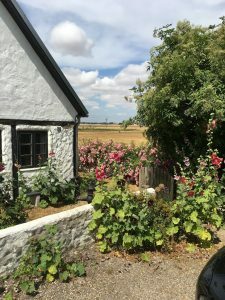 We drove past thatched cottages trimmed in blue paint and hollyhocks in a mad swirl of colours. Half-timbered red brick houses leaned at odd angles, fighting gravity more picturesquely than I ever will. Old windmills, their blades removed, had been converted into houses shaped like bee hives. In a huge, red brick barn behind the house dwelt antiquated farm equipment and nesting swallows. Gathering with friends in the garden, we sipped on local beer, Luxembourg crémant, chilled Chardonnay – a perfect accompaniment to boiled potatoes and salmon with a mustard and dill sauce – as the evening light drifted on and on… until, at last, an awe-inspiring sunset painted the clouds in dusky pink and wisteria purple. Beside the driveway, half a dozen cherry trees are thick with fruit and flocks of revelling birds. The lawn, burnt to a straw-yellow, prickled the soles of our feet, as we finally headed to bed. Sadly, since we left, bushfires have been raging in Swedish forests. Seriously, were we in southern Sweden or South Australia?